Did You Just Download LibreOffice? Do you want to use LibreOffice Calc for your spreadsheets? If you've used Microsoft Excel, it shouldn't be too difficult. However, if you haven't, you've probably noticed by now that it's just a little different from LibreOffice Writer. We'll help you get started with the basics if you just need a little extra boost to master this versatile software. Cell: An individual “box” in your spreadsheet. Cells are defined by their position in the grid. “A1” is the top box in Column A, “B1” is the top box in Column B and so on. Row: The horizontal strips in the spreadsheet, defined by their numbers (Row 1, Row 2 and so on). Column: The vertical strips in the spreadsheet, defined by letters. Goes from A-Z, AA-ZZ and so on. Chart: Very useful for situations where you want to compare results. Pie charts, bar charts, and line charts are three very useful options, though of course you might like to explore to see what's there. Range: The selected cells, rows and/or columns in a spreadsheet. Equation: You can use equations to add, subtract, multiply or divide the contents of cells if the contents are numeric. To exit Cell A1, use the “Tab” button to move to the next column or “Enter” to move to the next row. Clicking on any other cell also works, but don't get in the habit of using it because it will goof up your equations when you get started with them. To go back and edit, go back and double-click on A1, or if you prefer to start over, just click once to select the cell and type in your new data. Select Multiple Cells: Click on the first cell you want to merge and drag across to select cells across multiple columns. Dragging down will select cells in multiple rows. Click the “Merge Cells” button: The one my mouse in the above picture is pointed at. The cells are now merged and the text is centered. Why is the data in Row 2 left-aligned and the data in row 3 right-aligned? Well, those are the defaults for each type of data. Alphanumeric data (“Words” that include letters or a combination of letters and numbers) are left-aligned and numerals are right-aligned. If that looks funky, just use the text-align buttons on the same toolbar as the “merge cells” button. There may be cases where you realize you've forgotten to enter a row of data or a category column. Your new column or row will be inserted before the column or row you selected, so click on the gray box that contains the identifying letter or number to select it. Then, hit “Insert ==> Columns” or “Insert ==> Rows”. Sum: Adds up the numbers in the selected range. To do this quickly, hit the f(x) button to the left of the equation field to call up the Function Wizard, double-click SUM, and plug in the cell identifiers that contain the numbers you have to add up. It can do this for up to thirty cells. If you are adding up a continuous range of data, the equation can look like =SUM(B3:B5). If not, the equation can look like, =SUM(B3,B4,B5). Difference: f(x) is being tricky about this one, but if you manually enter =B5-B3 and then hit the “Enter” key, it will subtract the contents of the B3 cell from the contents of the B5 cell. Average: When deciding how much advertising on your website is worth, knowing the average traffic you get each month is very useful. To calculate the average of a range of data like visitors per month, the equation should look something like, =AVERAGE(B3,B4,B5) or AVERAGE(B3:B5). Maximum: Sometimes it will be useful to pick out the maximum number in a range, such as cases in which your website traffic spiked in a certain month or your sales rose in the week before Christmas. The equation can look something like =MAX(B3:B5) or =MAX(B3,B4,B5). Minimum: Has your business ever been through an unusual slump in sales? It can be a blow to both your bottom line and your ego if you happen to be the business owner. Knowing precisely when the slump occurred and whether it is part of a pattern can be your first step towards troubleshooting. You can track your minimum number in a range with =MIN(B3:B5) or =MIN(B3,B4,B5). A fun one! There are a ton of equations available in the f(x) shortcut. Have you ever wondered what date Easter will be on in any given year? Try choosing =EASTERSUNDAY(year) and enter the year you're curious about. This might be the whole point of using LibreOffice Calc for you. You want some snazzy charts and graphs for that presentation you have to give. To make a chart, click on the Chart button as seen above. Select your chart type (Bar, Line, Pie, etc. – plenty of options). Select the data range. To stay on the safe side, leave the dollar signs in place and tweak the numbers to your liking. Adjust the titles for your chart, legend, X-axis and Y-axis to your liking. Then hit “Finish”. You can adjust settings after the fact by right-clicking your chart and choosing the appropriate options from the drop-down menu. Since you are a tech-savvy person who knows how to get free software, you probably have some sort of Android tablet with Kindle Reader, right? 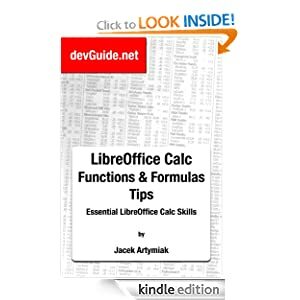 This Kindle Edition can help you master LibreOffice Calc so you can impress your friends, and hopefully your boss, by saving money and turning out the best spreadsheets ever.